Dental implants are considered by most dentists to be the longest lasting, most durable, and most attractive replacements for missing teeth. The American Academy of Implant Dentistry has stated that implants are the “next best thing to healthy, natural teeth.” Rooted in your jaw, implants are unlikely to need replacement in your lifetime! 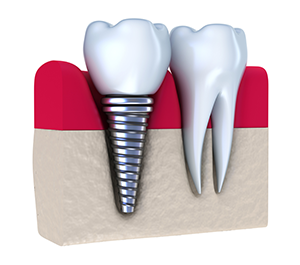 The implant itself looks like a small screw, and it functions as the foundation for beautiful dental restorations. Implants securely attach restorations of all sizes to the jaw, from single crowns, to bridges, to dentures. These restorations are generally made from ceramic or another biocompatible material, and are matched to your teeth so they blend right in. Unfortunately, not everyone is a candidate for dental implants. For an implant to take hold, a candidate must have proper bone density and have a strong immune system. In all cases, dental implants require strict oral hygiene and are not recommended for smokers. Like any restoration, implants require diligent oral hygiene and proper care to ensure they last a long time. According to a study by the Academy for Oral Implantology in Austria, however, implants have a 97 percent success rate. If you want to achieve excellent oral health, renewed confidence, and a perfect smile, call your dentist today to see if dental implants are right for you! The smile you always wanted could be just one phone call away! For more information on Implants in the Sugar Land, TX area call Lukin Family Dentistry at (281) 265-9000 today!